The challenge has been presented to our Call Center many times, What is the best way to hang art so that it doesn't become a hazard during an earthquake? Another way to think of this is, can modern hanging display system hardware benefit those living or working in earthquake areas? That short answer is, yes. First, let's be honest with one another. If the magnitude of the quake is so large that walls start failing, and furniture is overturned, we cannot, and quite honestly no one else can, provide a solution. If you expect a solution that will survive that form of unplanned urban renewal - stop here. Most earthquakes are of a more moderate scale and in the range of less than 6.0 on the Richter scale. Also, for most people, an earthquake will not occur directly under your feet. For you, please read on. There are three different approaches to this challenge. The first is to attach art from suspended cables. 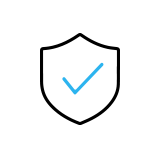 Most hanging cable systems are configured with what we call "suspended cables", where a cable, which is suspended from above, terminates behind the wall object. This creates a large pendulum from the art piece. This configuration is arguably better than that same art piece merely hanging from a nail in the wall, and certainly better than when hung from one of those "large national brand" adhesive hangers. During a tremor, the art will swing along the wall or out from the wall and this motion will act to accommodate significant movement of the earth. Yes, the swinging could be severe and yes, the art could slap back against the wall. Any glass in the frame could break if the quake is severe enough. However, the art is not likely to fall from the wall. If the shaking is so severe as to cause this sort of damage, it is probable that conventional art hanging approaches will fail outright. You would be picking up what is left of your art from the floor. If you are at all concerned with this sort of thing happening in your area we recommend you take one extra step. Consider using two cables to support the object instead of one. Not only does this configuration provide extra weight bearing capacity, the extra cable will also significantly lessen the pendulum effect. 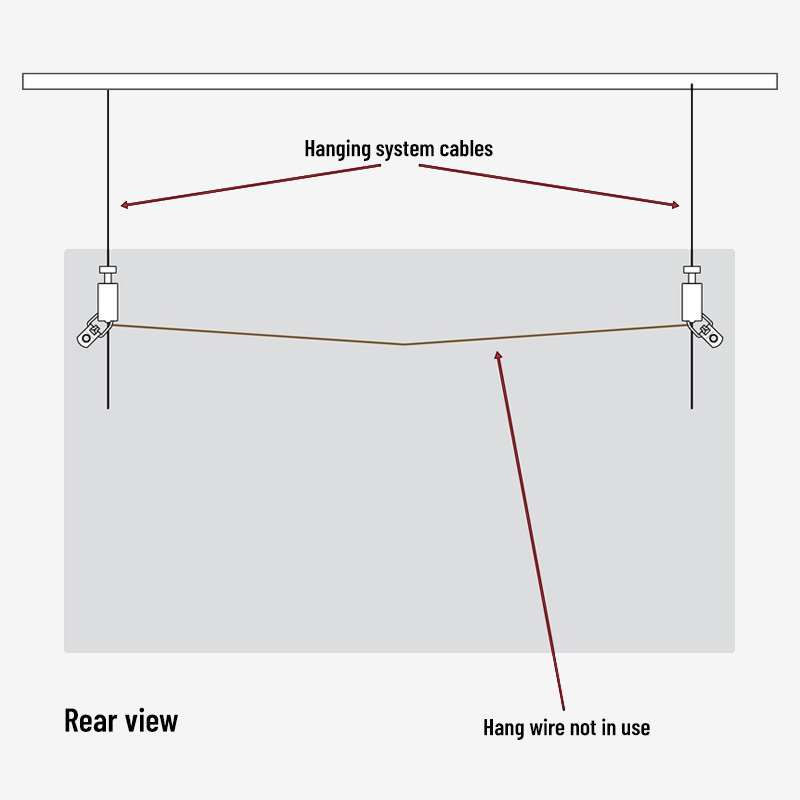 In the following illustration you can see how this would work by connecting our hooks directly to the hang wire attachment points. 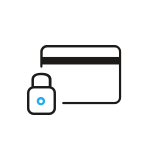 As for attaching art to the hanging system cable, we recommend a security hook such as our Mini Hook or our Secure Self-Gripping Hook. If suspended cables is a good solution for hanging framed photos in earthquake zones, then tensioned cables is the better solution. In this scenario there is a second parallel track, mounted low on the wall or at the floor, in addition to the upper track. The wall objects are then fastened to cables, which are held in tension between the upper and lower tracks with the assistance of spring action. This approach to hanging art avoids the pendulum effect during a tremor. 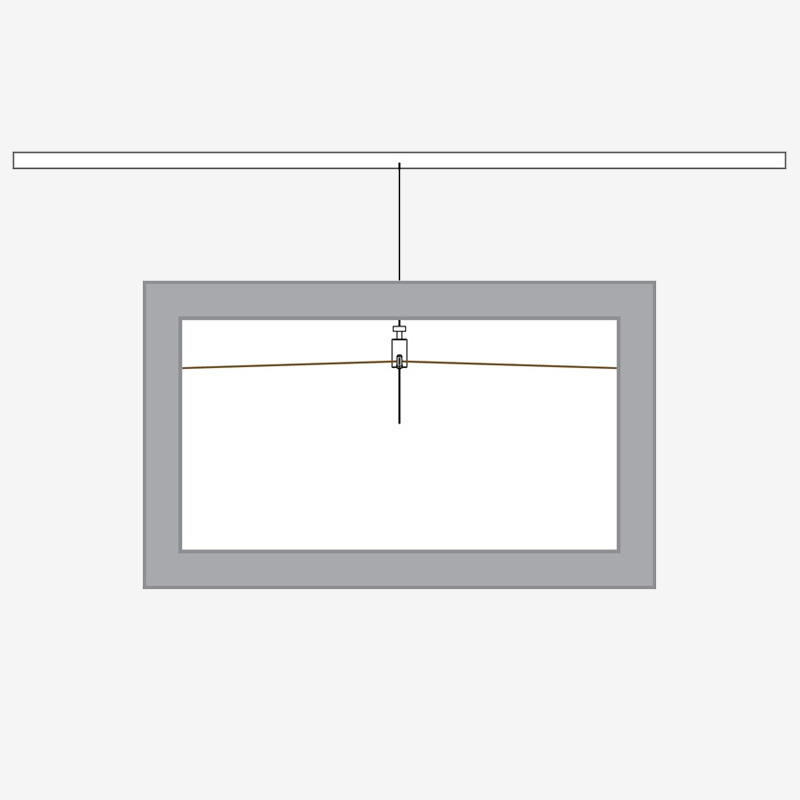 Sure, the art or wall objects will move relative to the wall, but since the top edge of the frame is secured to, typically, a pair of tensioned cables, the art is retained with much reduced latitude. Except for system, wall, or structural failure, there is nothing to fall and much less swinging. 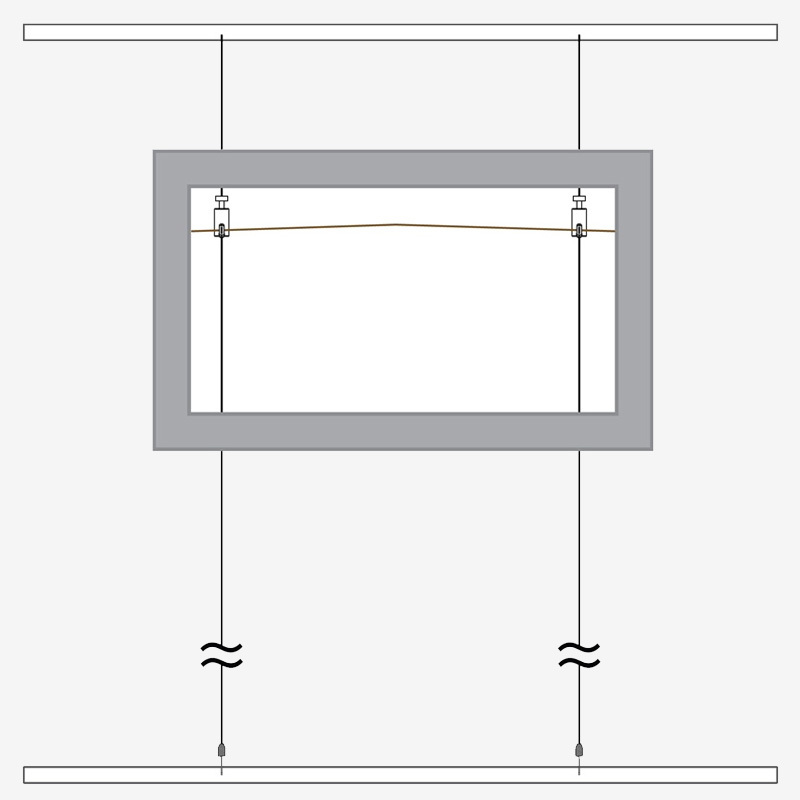 However, as opposed to the following illustration, we recommend in earthquake zones that the frame be attached to our system at the frame side rails rather than at the hang wire, as in the prior illustration. The greatest risk is at the lower edge of the frame. If the direction of the tremor movements is perpendicular to the wall, there is a chance the lower edge of the frame could move away from the wall and strike the wall on rebound. This is impossible to forecast, and is purely random and a function of the magnitude, direction, and frequency of the quake's energy. However, the lower edge of the frame is somewhat buffered by the tensioned cables. During a rebound, the frame bottom is likely to first strike the cables, and they are likely to absorb much of the impact energy. We also offer Bumpers that could assist in these circumstances. 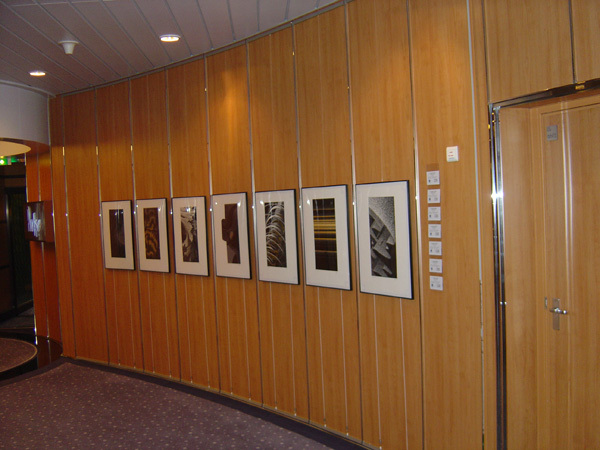 The most robust or best solution for hanging frames in earthquake zones is one that was reported to us by a customer who used our system for cruise ship art galleries. 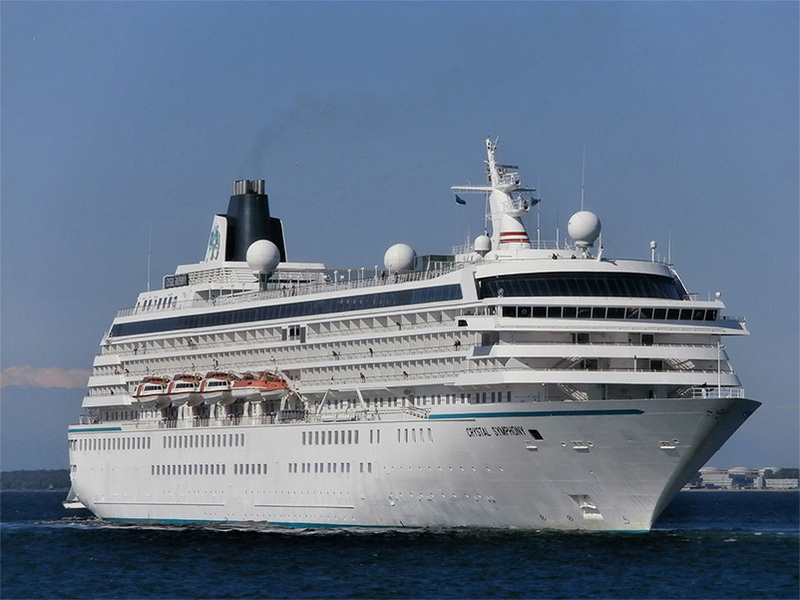 The Crystal Symphony is that example. As a ship is not a stable platform, where the walls may pitch as much as +/- 15 degrees or more from vertical, the problems faced by a ship's interior designer is similar to designing a hanging system to subdue earthquake energy. 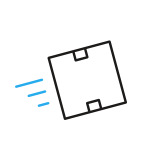 A tensioned frame solution is different from a tensioned cable in that there is no cable that passes from the upper to lower track. 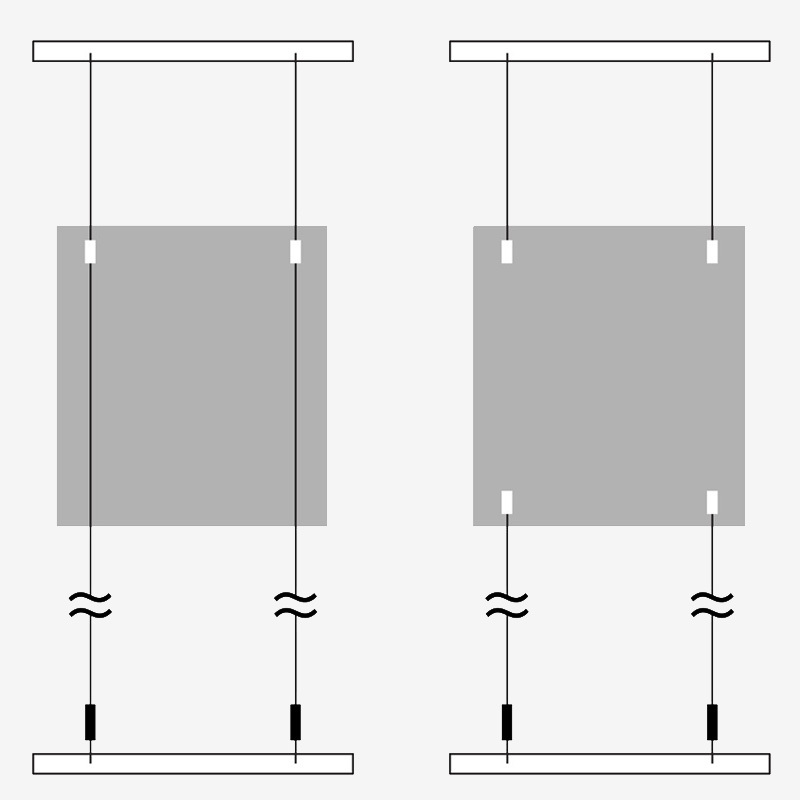 Instead, the cable that supports the weight of the frame, typically used in pairs, suspends the frame from the upper track and terminates behind the framed piece. They usually connect to the frame near the upper corners. This is similar to a Suspended Cable approach. 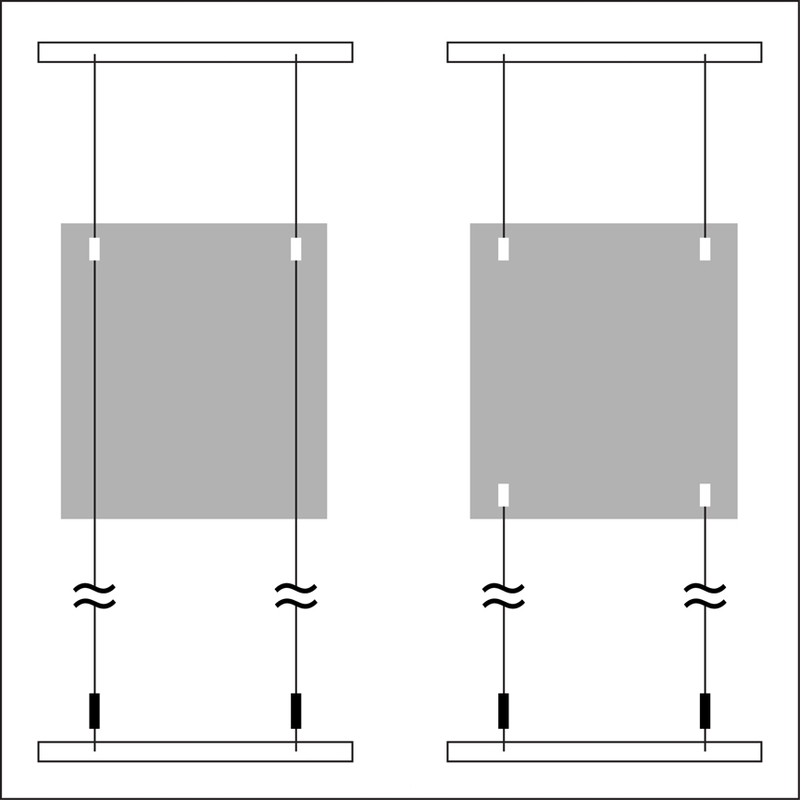 However, in a Tensioned Frame installation there is another pair of cables that connect to the lower corners of the frame. These cables extend to the lower track and are connected by means of a tensioner. 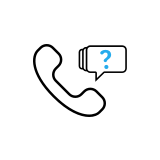 In this manner, the entire assembly is held in tension and, unlike the tensioned cable approach, the bottom edge of the frame is not free to swing with movement associated with a tremor. I'm sure I'm not alone in stating that I don't enjoy earthquakes. They can be a unsettling at minimum, and on occasion are downright terrifying. While Mother Nature will do what she will - leaving us with no control over her - these three options should help minimize the risk of damage to wall hangings and bodily injury caused by falling objects during a seismic event and can lessen the impact of nature's mischief. If you live in an earthquake prone area, you might think of hanging systems as another manner of earthquake preparedness.